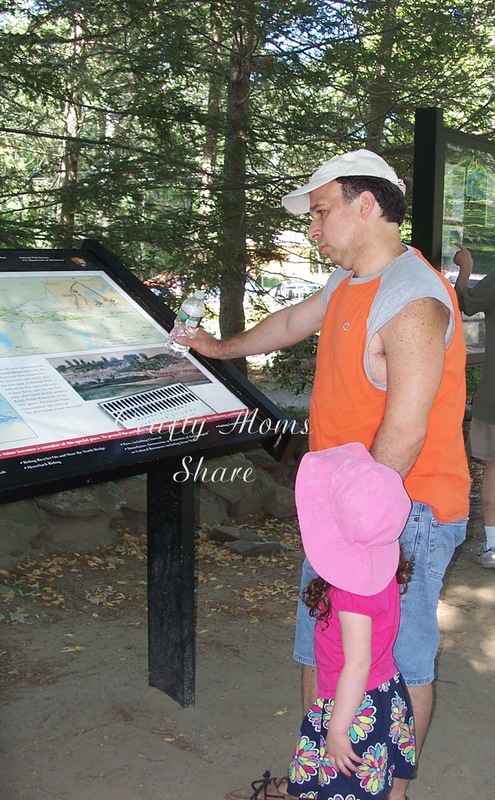 Have you done something fun and exciting with your family this week? 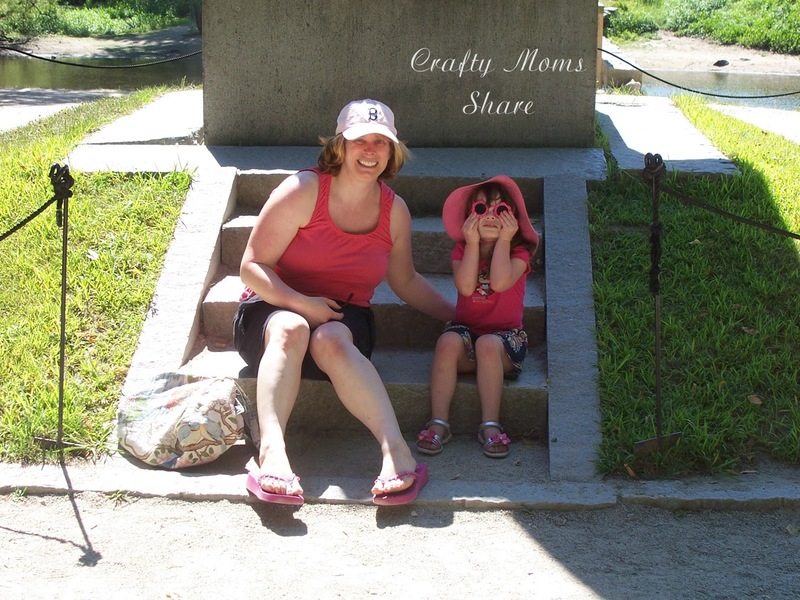 Want to inspire others to do more with their families? Kelly over at Happy Whimsical Hearts and I love to hear what you have been up to and inspire others. Please read my story (and Kelly's) and link yours up below! 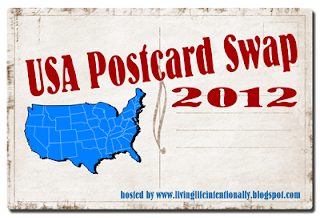 Have you heard about the USA Postcard Swap that Beth over at Living Life Intentionally is running? Well, we made it in for Round 2. We are mailing 50 postcards from Massachusetts to different people who will send us a postcard from one of the 50 states (it is 50 for Round 2 because somehow she ended up with 2 Massachusetts). There are still openings for Round 3. 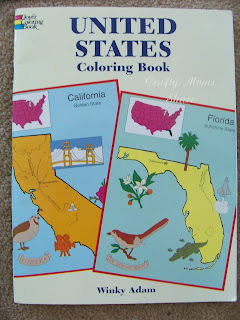 Even if you are not from one of these states, you can still represent them by buying postcards online & looking up some information at your local library. First come first serve for all remaining states!!! I think this will be a lot of fun. If you have any questions, please let me know! The latest update I received is she is just looking for someone to do Nebraska!! To join all you have to do is e-mail Beth with the state you are interested in. 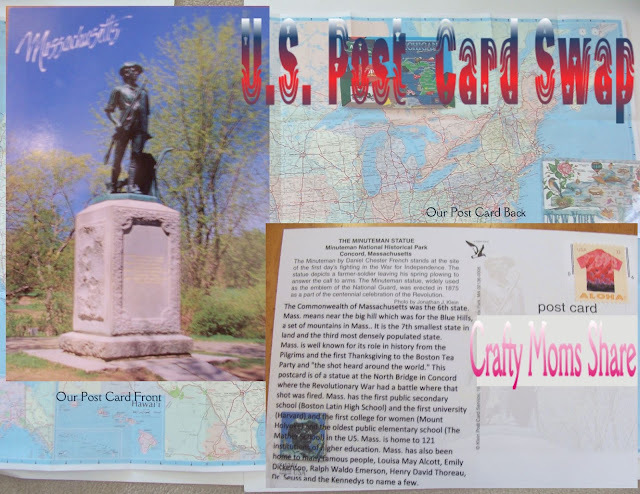 Then you buy your postcards and write some information about your state on each one and send them out. 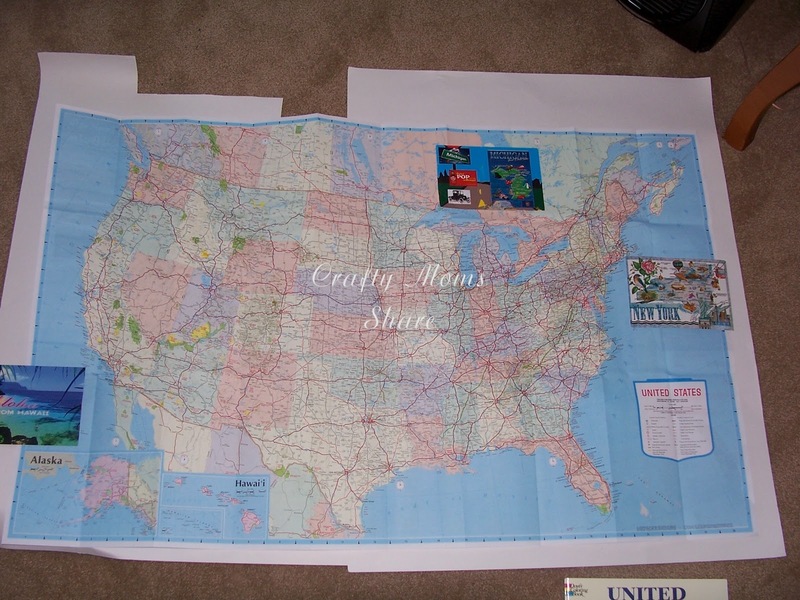 I went to AAA and got a map of the US and have a great idea of what to do with the postcards, so if you join in Round 3 make sure you check back here for a neat, educational way to display the postcards and map. 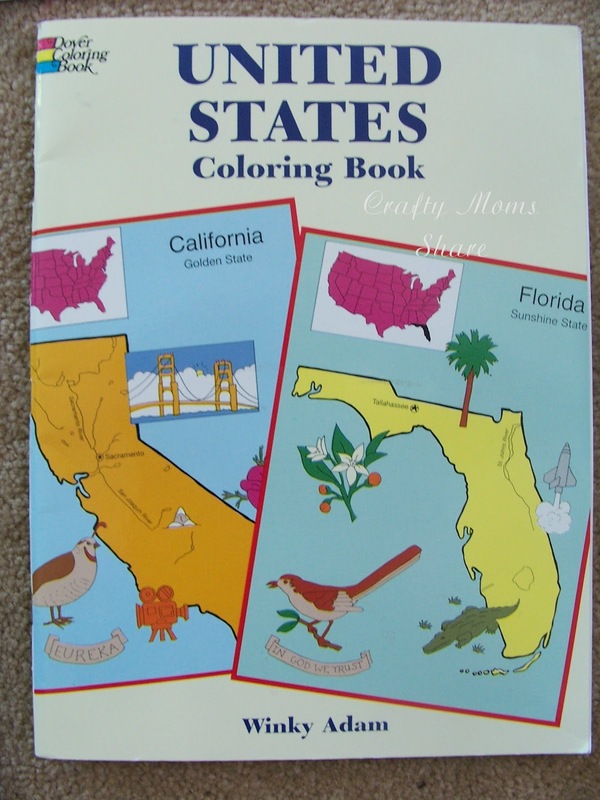 Oh, and I picked up this great coloring book at the used book store as well. And it has been fun to get the postcards. So far we have received them from New York, Hawaii, Michigan, and Oklahoma. Ok, why am I writing about this? Well, I was trying to figure out what postcard to send and what information to send. Remember there is someone else sending a postcard from Massachusetts (and several other people doing different states with Massachusetts addresses) so I wanted to make it unique. We go to Cape Cod to see my parents, but all of those postcards say Cape Cod and not Massachusetts. Everything around my house says Boston or one of the North Shore towns. Then I figured out we should go head to Lexington and Concord for a piece of history since let's face it, Massachusetts is known for its history. So this weekend, we went for a drive. 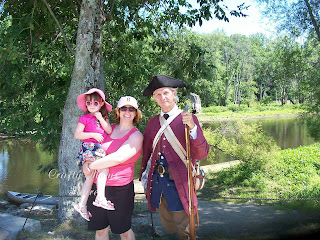 We drove through Lexington and stopped in Concord at the North Bridge. 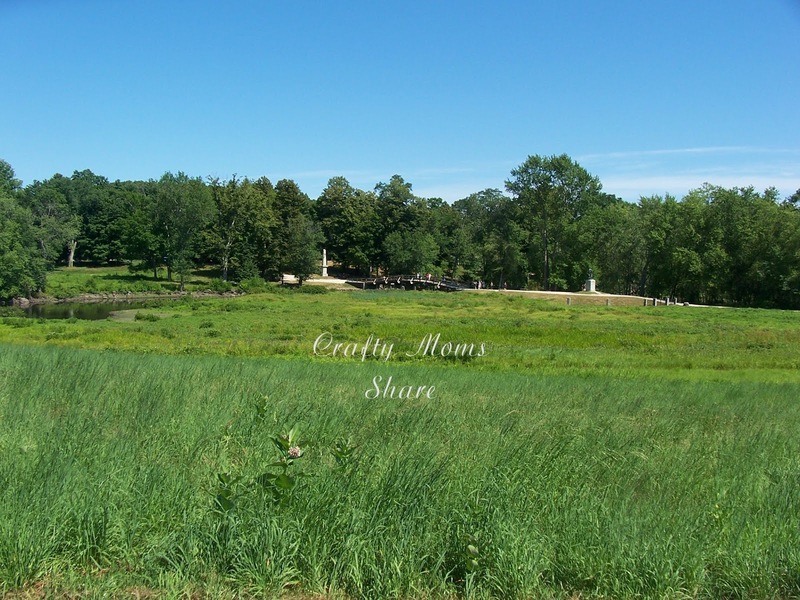 A sense of our country's history as you enter the area. Steve of course stopped to read it, and Hazel of course wanted to keep moving. I of course made them pose for a picture by the sign. 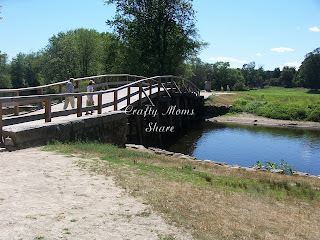 Then we headed towards the North Bridge. On this side was a man dressed up as a British soldier. He was standing in front of the marker of the Grave for the British soldiers who died here. He was very friendly and tried to get Hazel to communicate with him, but she played shy. 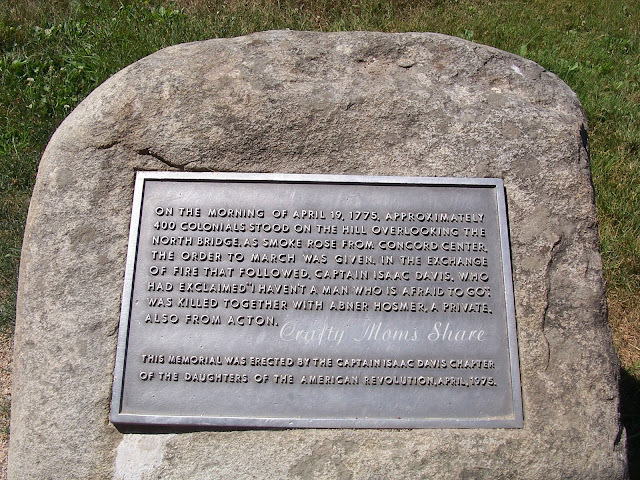 There also was a monument marking the battle. We stopped for pictures, but Hazel wanted to sit down so you cannot really see the monument in our pictures. She also wanted a picture of herself with each of us at the monument. Then we walked to the North Bridge. 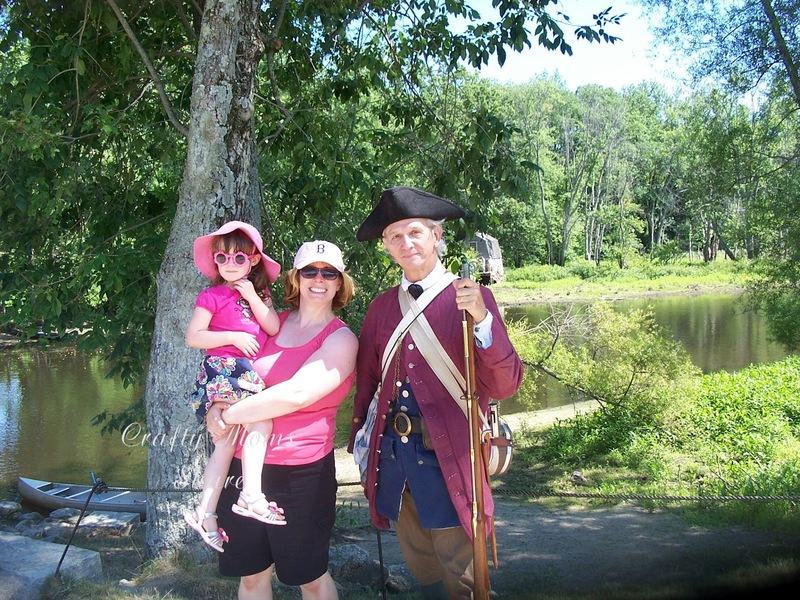 Of course for any of you who do not know the history of the Revolutionary War here and the North Bridge, you can read about the North Bridge here and more of the Revolutionary War history here. 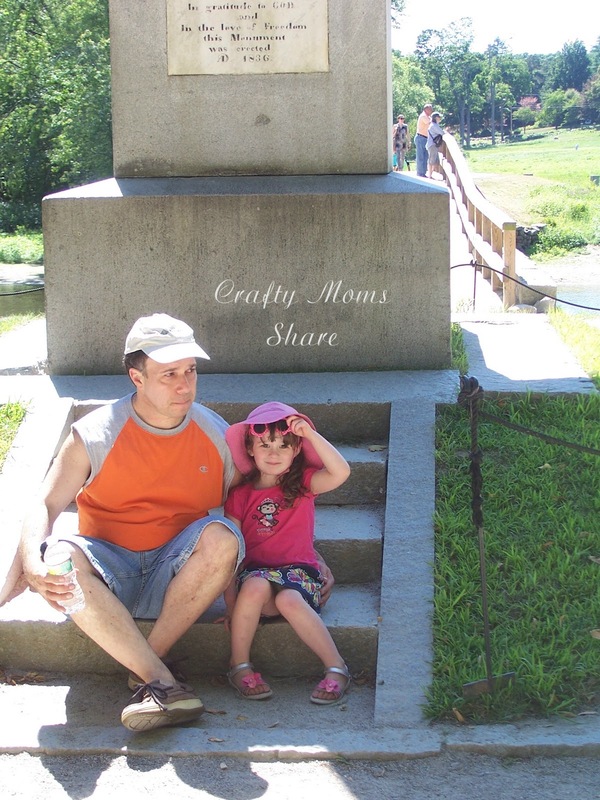 The North Bridge is where Ralph Waldo Emerson said "the shot heard around the world" happened. The North Bridge spans the Concord River. Now I should add when I first became a teacher I lived in the neighboring town, Acton, so I visited Concord frequently and love this town. The sense of history is amazing but the downtown area is also just quaint. Nevermind all the historical houses and the authors who lived there. Yes, I have toured The Orchard House (or the Little Women's House) that is just outside the downtown area and plan to take Hazel when she is older. Hazel of course wanted to run across the bridge. Now I should add that this is not the original North Bridge where the war began. 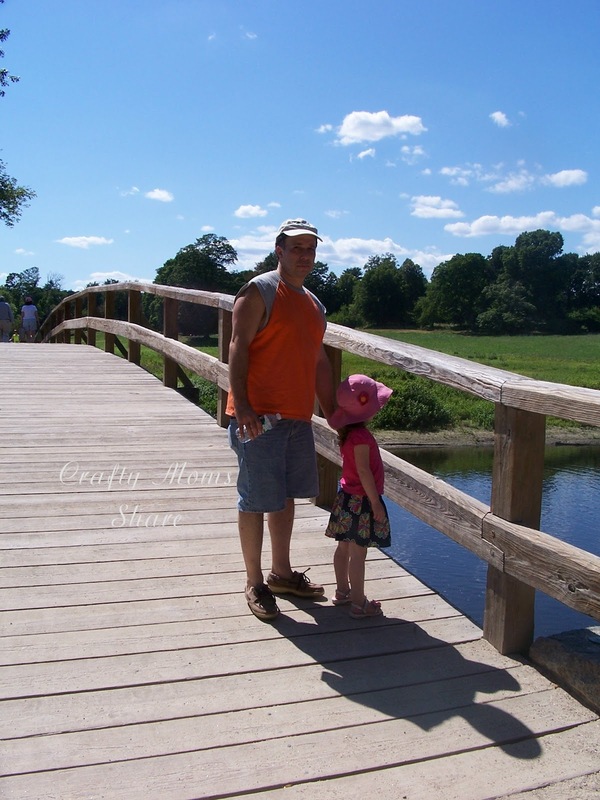 That bridge is long gone (1788 it was taken down). The bridge that is there now was renovated in 2005 but was built in 1956. At the Visitor's Center they have a piece of wood from the original bridge over a fire place. 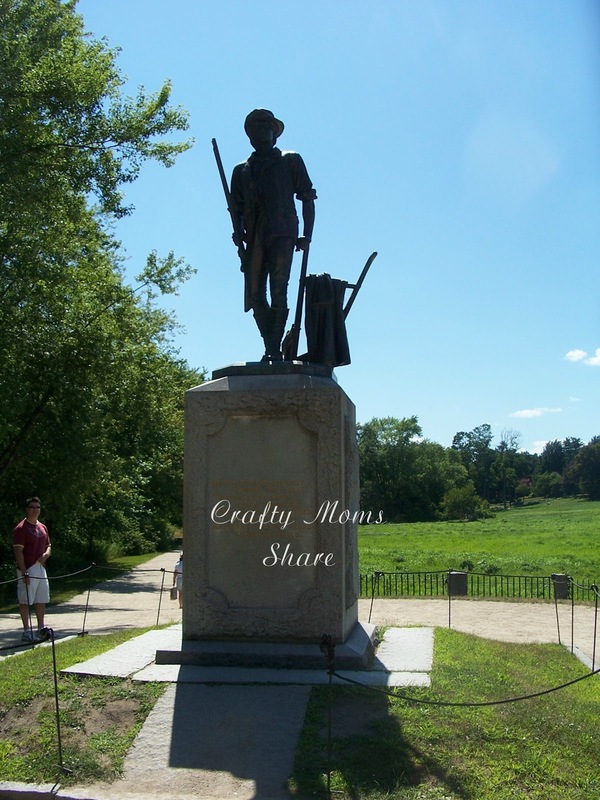 On the other side of the bridge is the famous Minuteman Statue. 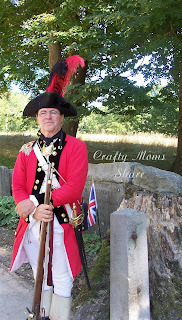 Also was a man dressed at as a minuteman soldier. We posed for a picture with him. 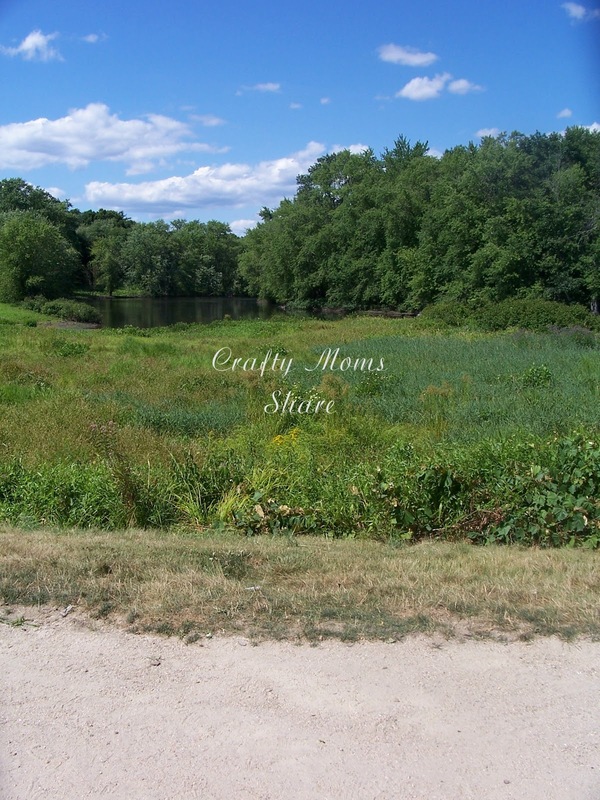 I didn't crop the picture so you could enjoy the beauty of the Concord River. I always wanted to canoe down it, but have not gotten around to it yet. People canoe and kayak down it and just pull their boats up here and visit the sites and then go on their way down the river. Also on this side of the river was a memorial for Captain Isaac Davis and Private Abner Hosmer. I remember driving by the Isaac Davis house all the time when I lived in Acton. It is a private house, but is marked. We walked up the hill to the Visitor's Center. The view along the way was beautiful. The view of the river and bridge from the top of the hill was also beautiful. 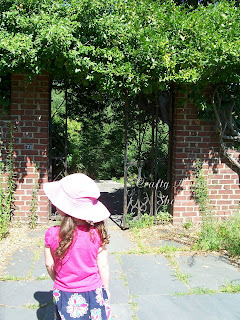 We explored the Visitor's Center and the gardens. Hazel found a fun gate to go through. Then we walked back over the bridge and to the car. We drove to the downtown Concord area. Hazel was hungry so Steve took her to get a snack at a local cafe that we had eaten in before and I went to the Visitor's Center and found my postcards. Then we checked out the amazing toy store and then headed back to the cafe for an early dinner and then came home. Although Hazel of course did not understand the history or importance, we had a lovely time exploring and walking around on a beautiful day. I mailed them out today so now more people will learn hopefully a little bit more about Massachusetts. Loved the ideas I found here last week. 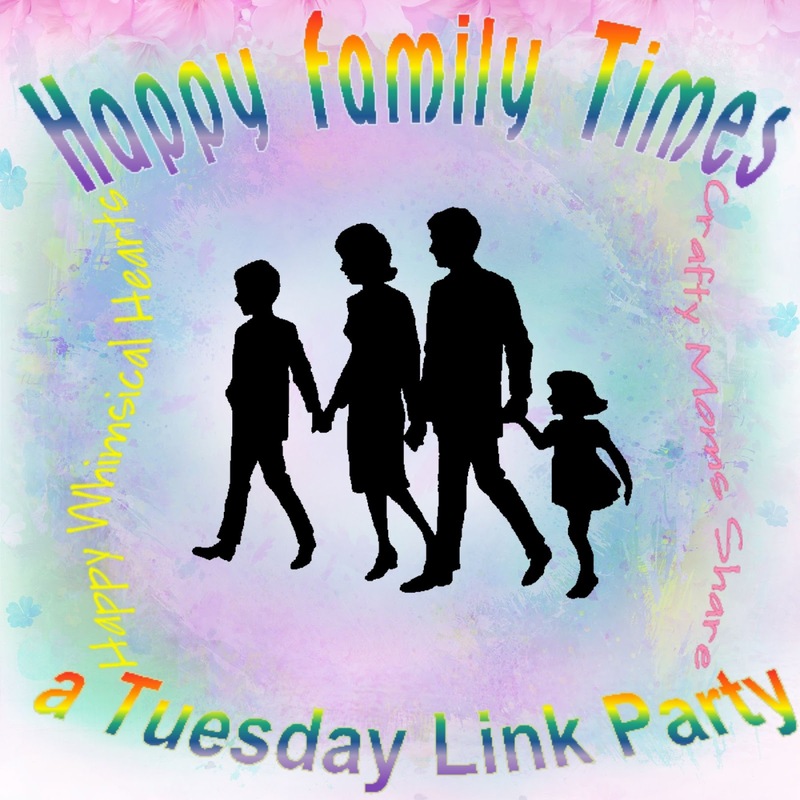 I added your Happy Family Times button to my sidebar.